Hull depth midships 41" 41"
Water capacity 6 gals. 6 gals. Holding tank (gray water) 6 gals. 6 gals. Fuel capacity 11 gals. 11 gals. 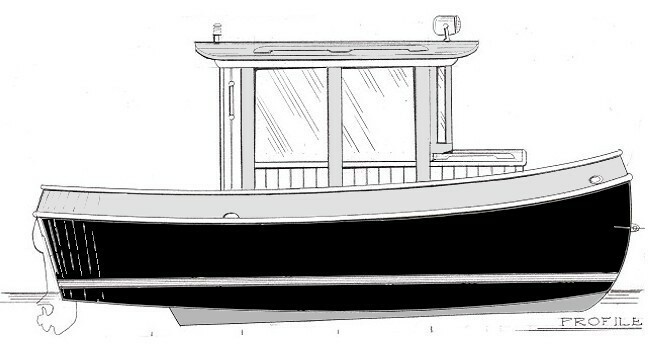 Hull type: Flat bottom, developed for sheet plywood with rounded stern. For standard sized plywood assembled by the Stitch and Glue construction method. Power: Outboard motors to 15 hp. A palatial, 50 MPH super yacht with deep carpets, marble countertops, and gold faucets is NOT the TUG ALONG. It is a simple, utilitarian, practical, miniature, affordable yacht that will turn heads whether on the water or perched on a trailer. And, it's easy to build; the flat bottom sheet plywood hull is built by the practical Stitch and Glue method with GLEN-L multiple patterns to put the construction within anyone's ability. TUG ALONG is small, not quite 16' or 18', but with it's 7' 9" beam, it seems much larger. The main cabin has 6' 6" headroom and with all the windows seems huge. There is room on one side for a small galley with stove and sink while the starboard side has space for a portable head, storage, and a nice helm station. The rounded stern is distinctive and the outboard motor (if short shaft) is concealed under the decks and runs in a partial tunnel. Yet the rounded stern is not difficult to build with the furnished patterns. Sleeping accommodations are spacious for such a diminutive craft. The vee-berth is lengthened by filler cushions that store under the side decks when not in use. When converted, the berth provides a maximum width of 5' 6" and a length of about 6' 3". When not expanded for use, there is space for a roomy helm station and passenger area. The simple flat bottom hull provides excellent stability, but combined with the high windowed cabin is not intended for open sea use. This is a boat to enjoy in quiet water bays, lakes or rivers. You are floating on the water supported by a large (comparatively) flat surface that won't rock from side to side when someone moves. A boat for the practical economy-minded sailor and one that the entire family will enjoy. To further simplify the building of the TUG ALONG check out the Stitch and Glue and Fiberglass Covering Kits described below. Materials to put this boat together. Click item name for detailed contents.